Just because Shoot & Sell runs from your iPad doesn’t mean you can’t show it BIG! Follow these tips to connect your iPad to a larger screen. CONNECTION METHOD: WIRED OR WIRELESS? This method works best if you are in your own studio that has a solid WiFi connection. Connect Apple TV to an HDMI port on either a Computer Monitor or an HDTV and simply air play your iPad to the larger screen! Because of the brilliant colors and contrast of HDTVs this is probably the most popular and cost effective option both in studio and/or at your client’s home. Most client’s have an HDTV, but make sure you ask if the HDMI ports are easily accessible before your in person sales session. If not, see the next item. 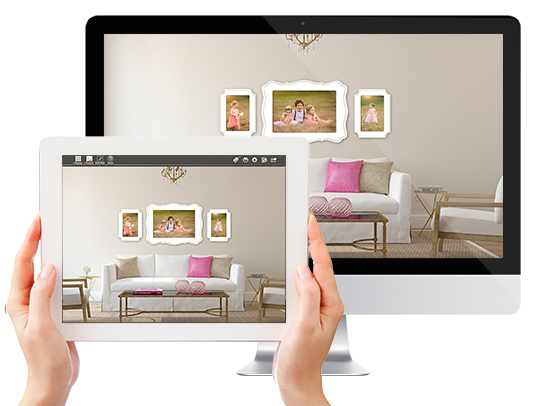 While projection via projector is very popular with other software that shows the image to scale, this is not necessary with Shoot & Sell as you are already showing them the size of their images relative to the walls of their own home. However, if you already have a projector you can certainly connect it to your iPad just the same way you can to a TV. Most newer projectors have an HDMI port, so an HDMI to iPad connector can be used (see “wired:connect via HDMI in the “ways to connect” section) but some older models may require a VGA to iPad adapter instead. If that is the case, use the “30 pin to VGA” adaptor for older model iPads and the “Lightning to VGA adaptor” for newer iPads with the lightning charger.